These Tutti Frutti Bottles with Infuser are selling out fast! Order today to guarantee your stock! This bottle is a cool 740ml! Back in 2017, Love Island was a huge hit and the season this year has been no different! The orders for these Tutti Frutti water bottles have already started streaming in and the rollercoaster of water bottles out the door has already begun. This year we have actually managed to get even more colour-ways in and now green, orange, black and red are in the equation! The whole country is sat glued to their screen at 9pm everyday ready to catch up with the daily gossip and news from the villa. Here at allbranded we are the same and this is the topic of almost all our lunchtime chats! 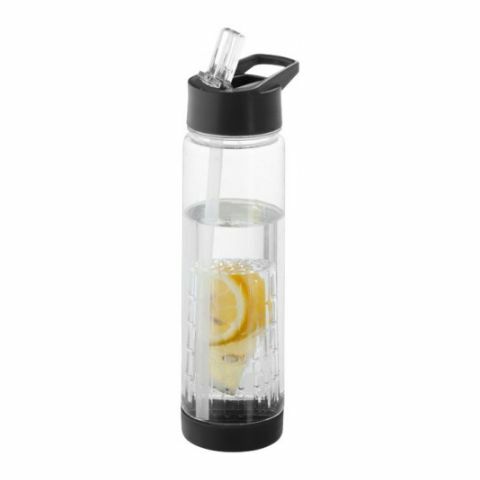 The Love Island App has allowed people to purchase both unbranded and branded water bottles with the fruit infuser attached. Last year alone we managed to sell over 60 thousand bottles of these bottles in only 2 months and this is something we will never forget. Even now there are Tutti Frutti bottles with infuser strewn across the office. The bottles themselves are not just for Love Island with companies such as Reebok now showing an interest. Whether Love Island is your thing or not, the water bottle remains super useful and is perfect for the upcoming summer season. The bottle has a large surface area allowing for your brand to stand out and now, as of this year, we can have a UK printer who can print from top to bottom! This allows us to really make use of the space! In terms of quality, this bottle is one of the best around. The straw mechanism opens and closes the bottle making it completely leak proof. The fact that the fruit infuser is actually removable is a great plus as well! This means that even if infuser bottles are not what you are after you can still use the bottle and it will still be ideal for your purpose. What’s more, the bag is perfect size for a handbag so you can carry it around easily! All in all, the Tutti Frutti bottles really are the real deal. At the moment there is a huge shift to water bottles with people now caring more and more about the environment. This thought combined with Love Island Fever means these bottles are flying off the shelves. Get in touch with one of the allbranded team by emailing sales@allbranded.co.uk or order online and get one now!